Anna Regoutz is an Imperial College Research Fellow in the Department of Materials, where she is part of the Functional Materials Theme. She holds a Visiting Scientist position at Diamond Light Source and is part of the Henry Royce Institute at Imperial. Her research focus lies on bulk, thin film, and nano materials for application in devices, including power electronics, photovoltaics, and biosensors. Her interests include novel growth methods for high quality thin films, nanostructured layers, and nanostructures of inorganic materials with a focus on metal oxides. She works on developing and advancing X-ray spectroscopy methods for bulk materials and surfaces/interfaces in electronic devices. She concentrates on using and developing both laboratory- and synchrotron-based spectroscopic methods to study in particular the electronic structure in oxide heterostructures. 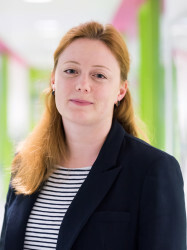 Anna uses her combined expertise in deposition and characterisation of these materials to understand and tune the materials’ electronic and optical characteristics to ultimately improve existing device concepts and develop novel device applications. Anna received her BSc (2009) and Dipl. Ing. (2010) from the Graz University of Technology, Austria. During the Masters programme (Dipl. Ing.) she concentrated on “Surface and Interface Technologies”. Whilst studying at Graz she worked at Infineon Technologies Austria, Villach, Austria, where she conducted research for her Masters thesis titled “Evaluation of Decapsulation Methods for Semiconductor Devices”. She conducted her D.Phil. research in Inorganic Chemistry between 2010 and 2014 under the supervision of Prof. Russell Egdell at the University of Oxford, UK, and Trinity College, Oxford, UK. The research focused on structural and electronic properties of metal oxides. During this time she was awarded a graduate scholarship by Trinity College, and served as the President of the Middle Common Room at Trinity College from 2011-2013. During the academic year 2012/13 she held a non-stipendiary lectureship in Inorganic Chemistry at Lady Margaret Hall, Oxford, UK. Anna is a member of the Royal Society of Chemistry (MRSC), the Institute of Physics (MInstP), the Materials Research Society, and of the Society of Austrian Chemists GÖCH. She currently serves as a co-opted member of the Dielectrics and Electrostatics Group committee of the IoP and as a member of the Solid State Chemistry Group committee of the RSC. In 2018 she was awarded the Student Academic Choice Award for Best Teaching for Undergraduates at Imperial. Anna is an Associate Editor in the Understanding the Earth and its Resources section of Frontiers for Young Minds, an open-access scientific journal written by scientists and reviewed by children. For a more creative, non-standard view of what Anna thinks about topics related (and unrelated) to her research, check out this recent interview by Dr Keith Butler, which is part of the Materials Hipster series.